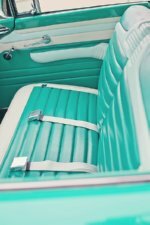 The most luxurious cars have always had leather upholstery. Today, it's more popular than ever, appearing in trucks, economy cars and family sedans either as standard equipment or as a dealer installed option. While its comfort and beauty are undeniable, leather can wear and begin to look old before its time. Leather also stains easily and frequently cannot be rid of the stains by mere cleaning but needs to be redyed or restored. And thanks to the advances in coating technology today refinishing leather is something many people can do themselves. It also presents a business opportunity for those looking to be self-employed. The first step is to examine the leather to decide whether it needs replacement, restoration or refinishing. A lot depends on what your goals are for your project. For custom work or a like new restoration replacement is necessary, but more on that later. In many cases, retaining original materials as much as possible is important as this may help maintain the overall appeal and value of the car. Restoration is definitely cheaper than replacement as well. And some people just plain prefer the look and smell of old leather in an old car. Physical damage to the leather may require replacement but this doesn't mean that you have to replace everything. If the rest of the leather is in good condition or can be restored then just replacing the damaged panel(s) may be all that is needed. Also, small rips and tears can be successfully repaired. Frequently, the damage is just surface abrasions which can be repaired and refinished. Naturally, if you were refinishing the whole interior this should be done first. A natural part of leather's aging is that fine cracks develop over time. Left untreated, the cracks will grow larger, sometimes splitting wide open. depending on the condition of the leather these, too, are sometimes repairable. Stains, ink, soft drinks, nail polish, color transfer from clothing and pet stains are usually permanent in leather. Attempts to clean them usually result in removing the color from the leather and even damage to the leather itself. Long term use without cleaning and preserving the seats also results in permanent dinginess, especially in light colors. The only solution is to refinish the surface. In the case of very old leather that hasn't been properly stored or treated the leather breaks down and loses its strength. If the leather easily tears when you push on it or pull at an existing rip you most likely have dry rot. Replacement is your only option. Loss of colorFrequently the only problem with a leather seat is that some color has worn off. Recoloring the affected area is all that is needed. Leather that hasn't been properly treated over the years is likely to dry out and become stiff. This can most likely be softened with the use of a conditioner such as Leatherique Rejuvenating Oil.